Emporio Rulli’s panettone makes Giada di Laurentiis foam at the mouth, so you figure it’s got to be good (Italian + trained pastry chef = knows delicious when she tastes it). I’ve never tried Rulli’s version because the shipping ($31) costs more than the actual panettone ($18.50). Also, I can get an awesome one from Trader Joe’s for $4.99—somehow I doubt the Rulli one tastes 10x better. 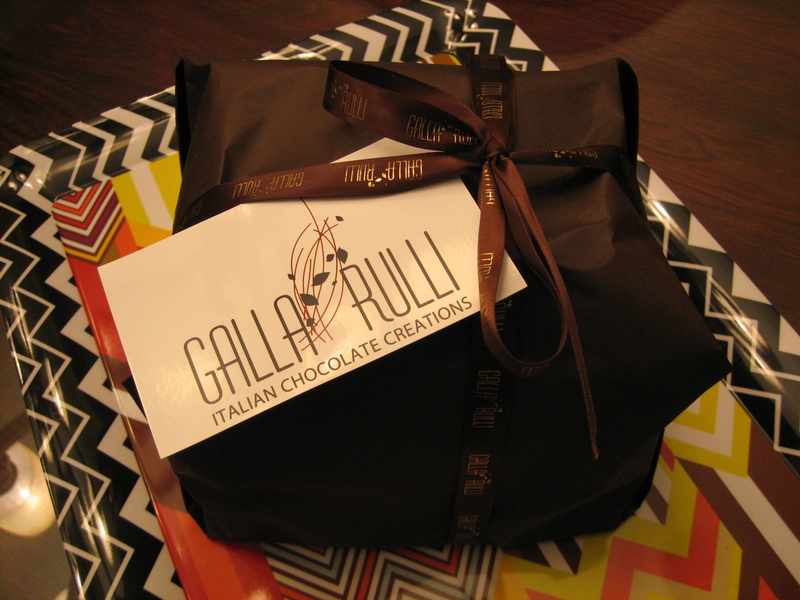 But but but—I’ve been really curious to try this chocolate version Rulli makes for Gilt Taste (a site that carries a lot of fancy foodstuffs you’d be happy to gift, but feel guilty buying for yourself). I’ve never seen a chocolate panettone in the stores. And maybe I’m just a sucker for good storytelling, but how can you not want to try it after reading this description? Anyway, the $53 price tag has always held me back from hitting the “buy” button. However, Gilt recently offered a 50% off voucher for everything on Gilt Taste. So I finally caved and ordered the 2.5 chocolate-butter behemoth on Cyber Monday—the 5-cent shipping special was the clincher. If you haven’t tried panettone, you’ve probably at least seen it on grocery store shelves this time of year. It usually comes in a square box or foil/cellophane wrapping. From the images, it resembles a cousin of fruitbread. Don’t start hating yet, though. 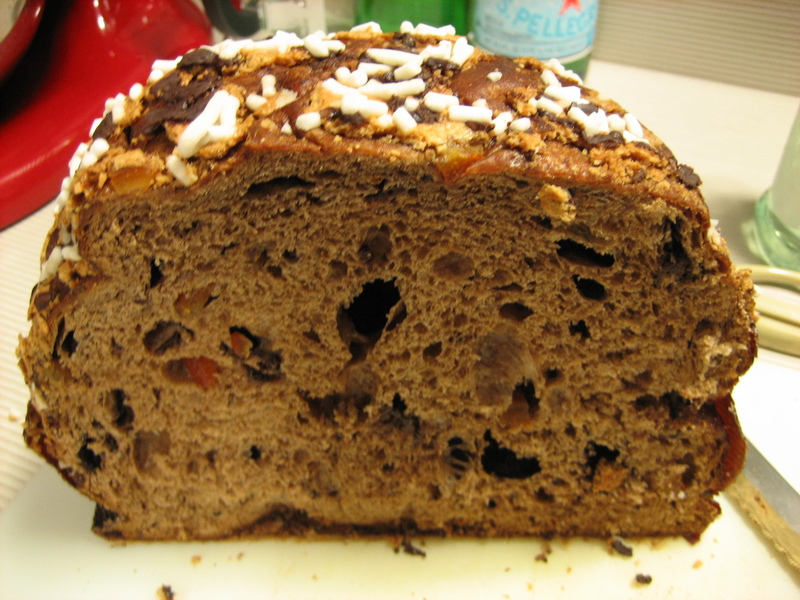 Panettone is closer to a buttery bread, like brioche, with small pieces of preserved fruit. I’m not a fruitbread eater (and personally don’t know any under the age of 50 who is), but I could eat light, fluffy panettone year-round. Preferred serving style: toasted with a bit of butter. Anyway, the Rulli panettone came in the mail beautifully packaged (that’s why these things make good gifts—no additional wrapping needed). It almost made me sad to ruin the wonderful presentation by opening it. The panettone is “iced” with almond paste, white sprinkles atop. Chocolate and orange peel bits stud the fluffy, bready innards. Given the way I’d hyped this up in my head, it couldn’t nearly taste as good as I’d hoped. Its main failing is that it’s just not chocolate-y enough. That could easily be solved with bigger chocolate chips. Also, just because you bake something with a buttload of butter doesn’t guarantee moistness (vegetable oil does a much better job). Panettones are actually somewhat dry, as was this one. Orange-chocolate fans will like this, but again, I’d brainwashed myself into thinking that it’d be a much more sublime experience. In sum: when I think about how many Trader Joe’s panettones I can get for the same price, I can’t justify getting Rulli’s again, even at half price. One day on our San Francisco trip, we got off from an overcrowded cable car sweaty and ravenously hungry. I needed to get some food down my gullet, and quick. There was a Taco Bell nearby. Tempted as I was (yeah, I know I’m in in the minority as far as being a Taco Smell fan. But I’d still consider eating their taco supremes even if I found out they were made with Alpo. I said consider. ), we were in the city of tasty foodstuffs, so we felt obligated to try harder. That’s how we ended up at La Boulange. While I was in line, a glass case of pastries and macarons stared me in the face. Since I couldn’t get it out of my mind for days, we made a point to stop by again on the last day of our trip. The almond croissant–while topped with lovely roasted almonds–was stingy with the filling. The pastry, not as flaky as we’d hoped. Solid showing, but not a stunner. As for the macarons, the poor things endured a 12-hour trip back to the East Coast, including a layover in Dallas. They were in a dilapidated, soggy state by then. Luckily, we took these photos while they were still presentable. The other place we tried on our last day was Samovar, a “tea lounge.” Because the online reviews of this local chain were mixed, we were on the fence about making the effort. But I’m glad we did. The Yerba Buena Gardens location is in a serene spot overlooking the gardens. On a nice day, it’s probably a prime place for getting cozy with a kettle of tea. We sat inside, where the air was heady with incense–the smell actually turned my stomach a little. This rosewater-tinged Greek yogurt combined some things I’m not crazy about: dates and walnuts. Yet it was so, so good: spoonfuls of Middle-Eastern flavors perfectly melding together. Mr. X-sXe had the quinoa waffles, which are described as “pillowy” on the menu. That, they were. The syrup that came with it almost tasted of molasses, but our waitress said it was made of palm sugar. Either way, it had a caramelized flavor that made us want to do shots of it. The tea at Samovar is pricey, but we shared a pot of pu-erh that the nice waitress kept refilling with hot water. The earthiness of the tea was a nice complement to our treacly breakfast dishes. Tartine San Francisco. Sharing not recommended. Upon finding out I was headed to San Francisco, a coworker recommended Tartine, calling it “a transcendent experience.” He wasn’t kidding. It’s a modest-sized French bakery in the Mission District offering over-the-top luscious pastries, cakes, and toasted sandwiches. We had a hard time making up our minds about what to try–so many temptations. Fearing that if we didn’t decide fast, we’d get trampled by the crowd behind us needing their sugar/cream/cheese fix, we landed on the lemon meringue cake and bread pudding. The bread pudding was hands-down the best I’d ever had. Bread pudding isn’t something I normally gravitate to. It’s one of those desserts that varies too much from place to place. But this bread pudding was more like a flan or custard, topped with caramelized nectarines. Wow. Onto the (humongous slice of) cake, a creative interpretation of lemon meringue pie. The menu describes it as “lemon-moistened genoise layered with caramel and lemon cream.” While the caramel didn’t come through, the lemon flavor permeated the moist cake nicely. I was one the fence about the meringue icing. It was a little eggy for my liking. 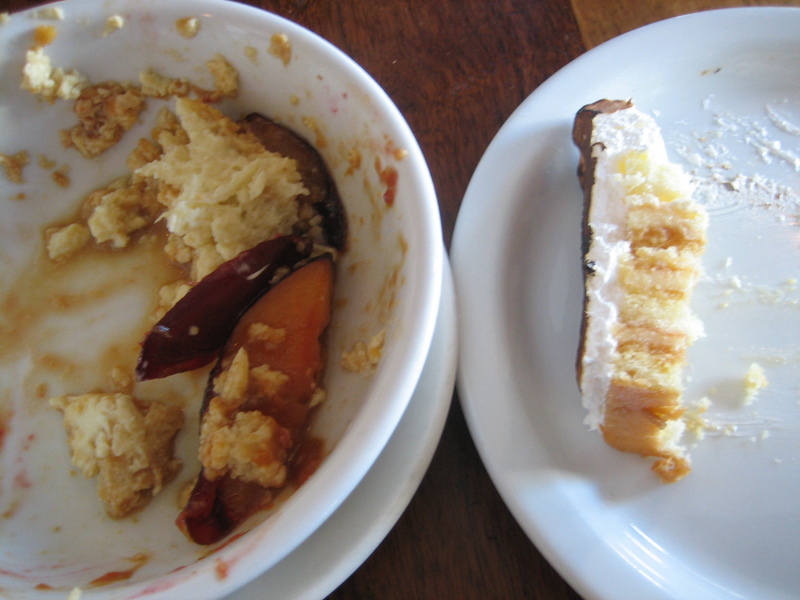 By the way, if you decide to share your desserts, you might want to wait until you’ve had your fill before taking a break. I came out of the ladies’ room to find only a bite or two left of each. Mr. X-sXe had seized the opportunity to eat more than his share, spinning it as, “Look, I left this for you!” Grrr. PS: If you can’t make it to Tartine, there’s always the cookbook. Here’s their take on yogurt: just barely tart, a drizzle of honey, the softness of the pears playing off the crunch of the almonds/cereal. Sigh. I could probably eat breakfast at Farm Table every morning and never get bored.